On TodayTix, you can find tickets from 18% up to 71% off and sometimes higher. Add a referral code on top of that and you can save even more. Skip the lines. Forget waiting outside Times Square in the cold to get access to discounted tickets. Whip our your phone instead, download the app, and surf cheap Broadway tickets on your iPhone (or Android, no judgement). Don’t you love getting a discount on top of a discount? 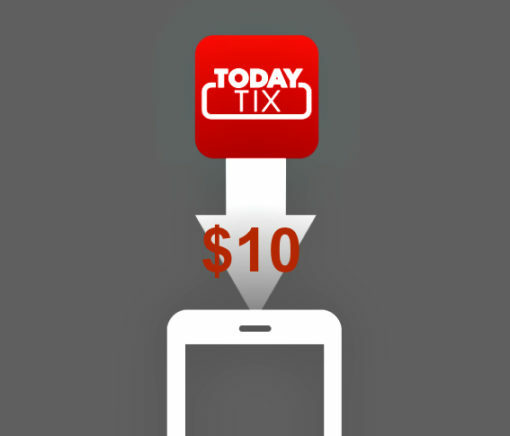 TodayTix’s referral program offers $10 rewards on friend referrals. This works both ways! When you use a friend’s referral code, you both receive a $10 towards your next purchase. When you enter the referral code upon checkout, you’ll receive $10 off your purchase. In return, your friend’s referral account will also be credited $10. Win for you. Win for your friend. I’ve been using TodayTix since 2014 and continue to be impressed by the quality of their service especially the Concierge program where TodayTix employees stand out front of the theatre doling out discounted tickets to their users. All through 2016 and 2017, I’ve counted on friend referrals and gotten some great discounts toward spectacular shows including Wicked (WORTH IT), The Color Purple, Fiddler On The Roof and The Humans –something you can do too once you sign up. TodayTix is in several cities now and they continue to expand. As of 2015, after expanding into London’s West End, TodayTix opened in Washington DC, San Francisco, and Los Angeles markets, with plans of continued expansion to other American cities and outside of the United States. TodayTix’s refer and save program is another thing that makes TodayTix a great service to use when shopping for Broadway tickets. TodayTix is still my favorite place to search for and purchase tickets for Theater. Built into their app are different filters that allow you to peruse upcoming shows. You can still get $20 off on TodayTix tickets with this code How to get a TodayTix discount in San Francisco How does TodayTix’s Broadway ticket Lottery work?